After a tough second round last week at the Barclay's which resulted in a missed cut, Michael Thompson will be looking to rebound at the Deutsche Bank Championship. Last week's missed cut dropped Michael to 58th on the Fedex Cup points list. Only the top 70 players on that list will advance to the third round of the playoffs at the BMW Championship in a couple of weeks. A rebound is not without precedent this year. The last time Michael finished last of those who completed two rounds to miss a cut (the Northern Trust Open), he followed that performance with his first victory on the PGA Tour at the Honda Classic. Michael will be playing with Angel Cabrera and Ryan Palmer for the first two rounds. They tee off FRIDAY at 7:52am ET from the first hole. You can follow the projected FedEx Cup points list at the link below. When you look at the list, keep in mind that each event in the playoffs is worth five times that of a normal PGA event, thus players can rocket up the points list with a good performance. Michael will be grouped with Angel Cabrera and Roberto Castro and will be teeing off at 12:33 ET. For the second time this year, Michael Thompson posted a top 25 finish at a major championship. Earlier this year he finished tied for 25th at the Masters. This week he finished in a tie for 22nd after a one under par 69 in the final round of the PGA Championship to finish even for the tournament. Based on the results this week, he moves up to 36th on the Fedex Cup playoff list. The playoffs start in two weeks at the Barclays for the top 125 players in Fedex Cup points. Each playoff event is worth five times the points of a normal PGA Tournament so even though Michael has a good start on Fedex Points he'll need to play well in the playoffs to continue to advance with the ultimate goal of making it to the Tour Championship which is reserved for the top 30 golfers. Michael Thompson tees off on hole #3 during the third round of the PGA Championship. Michael's tee shot came up about 25 feet short. This birdie putt missed going in by a few inches and Michael tapped in for par. Michael's tee shot on hole #6. Michael's birdie putt on hole #6 just slides by the hole. He went to make par. Michael watches his tee shot on 11 closely. The tee shot just missed the hole and came to rest a mere 18 inches from the hole. Michael tapped in for birdie. Michael made this 50 foot putt for birdie on hole #15. On a day that saw rising scores, Michael Thompson hung on and finished +2 for the day. That leaves him at +1 going into the final day tied for 28th. He'll be teeing off at 12:15 ET on Sunday and will be paired with Marcus Fraser. During today’s second round of the PGA Championship, early rain bedeviled the morning round players while it benefited the afternoon wave which Michael Thompson was a part of. Softer greens allowed for lower scores, and Michael took advantage. For most of round two, Michael was sitting a single shot inside the cut line. While a lot of golfers were taking advantage of calm winds and soft greens, Michael was playing a solid, if not remarkable, round of golf. He completed his first 11 holes at even par posting a lone bogey against a lone birdie on consecutive holes early in his round and then ran off a streak of seven consecutive pars. That’s when Michael really started firing on all cylinders, making four birdies in a six hole stretch. He finished -3 for the day (-1 overall) and vaulted 52 spots up the leaderboard into a tie for 22nd. He'll be paired with Paul Casey for round 3 and will be teeing off at 12:45 ET. 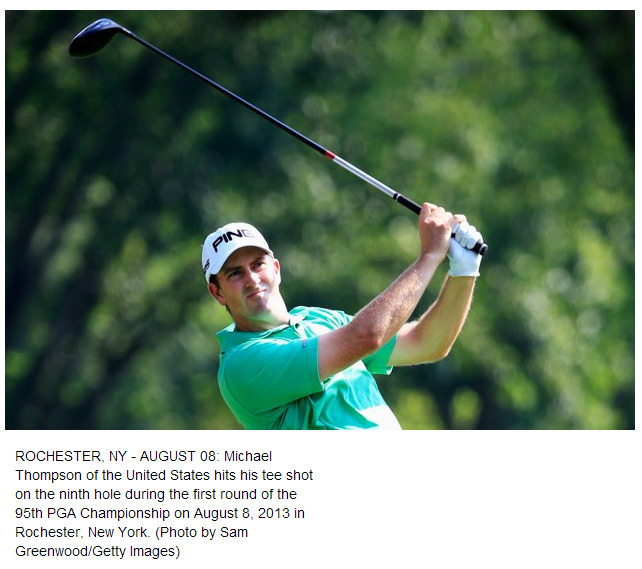 With the first round of the PGA Championship complete, Michael Thompson sits at +2, T74. Due to the lack of any stats, play by play or Shotlink Data on the PGA website, I can't infer any insight about how todays round went, other than to say he scored 2 birdies, 4 bogeys and 12 pars. Currently one over the projected cut line he'll be looking to improve upon his score when he tees off at 1pm local time on friday. He'll be grouped again with Marcel Siem, however the third person in his grouping, Bo Van Pelt withdrew from the tournament due to a hip injury. Tomorrow, Michael Thompson will tee off in this season's last major: the PGA Championship. This year's PGA will take place at Oak Hill Country Club in Rochester, NY. The Donald Ross designed course is a classic par 70 and will look a lot like a US Open as the rough has been described as "penal". There has been a lot of talk that a score of par may win. That remains to be seen but Oak Hill is expected to play tough and that's typically the kind of course and tournament Michael likes. Michael will be playing the first two rounds with Marcel Siem and Bo Van Pelt. They get their first round off at 7:50am ET. There won't be Shot Link coverage this week (since that is a PGA Tour feature) but the PGA website will have live streaming coverage of the par 3 holes starting at 1pm ET. Michael Thompson saved his best round at the Bridgestone Invitational for last as he shot a bogey-free two under par 68 and finished in a tie for 21st. This marks Michael's second consecutive top 25 finish in a WGC event. He moved up to 38th on the Fedex Cup points list and up to 34th on the money list. He also moved up to 51st on the OWGR list (22nd in the US). Michael's round was highlighted by some great ball striking. He hit 10 out of 14 fairways and two of the missed fairways were in the first cut of intermediate rough. He also hit 12 out of 18 greens in regulation and four of those missed greens were on the fringe. Despite the great ball striking, Michael was happiest with his putting. After the round he tweeted "NO 3 PUTTS!" Next week he'll be in Rochester, New York to compete at the PGA Championship which will be held at the Oak Hill Country Club's East Course. By his own account, Michael Thompson "played really well today" where he shot a one over par 71 and is currently tied for 43rd after the first two rounds of the WGC Bridgestone Invitational. The stats would seem to back up Michael's assessment. He hit 14 out of 18 greens in regulation and his driving distance was much higher than normal at 314.5 yards. The lone hole in his game today was his putting where he was -2.654 in strokes gained putting. After his round, Michael assessed his day on Twitter: "I played really well today just couldn't get the putts to fall." Tomorrow's third round has been pushed back a bit to avoid some expected morning thunderstorms Michael will be paired with Boo Weekly and Nick Watney for the third round. The group will tee off from the tenth hole at 11:30am ET.